Looking back in hindsight, it seems safe to say the Cowboys' 4-12 season wasn't a result of Brandon Weeden's play at quarterback after Tony Romo broke his collarbone the first time. Weeden struggled, there's no doubt, but you could make a pretty solid case he was better than the guy the Cowboys replaced him with via trade in Matt Cassel. Remember, it was Weeden who was behind center when the Cowboys lost consecutive games to Atlanta and New Orleans — both games where the Cowboys' offense wasn't the problem. So when the Cowboys brought in Cassel and sent Weeden packing upon Romo's game-and-a-half return before his subsequent broken collarbone, Jerry Jones made some comments about being more prepared at backup quarterback in 2016 than they were in 2015, and they understandably rubbed Weeden the wrong way. 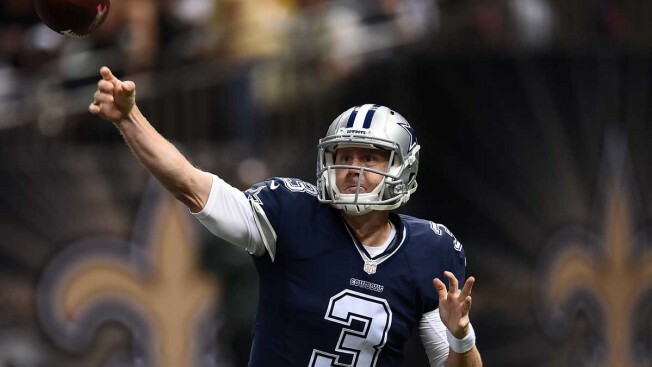 Weeden joined Ben and Skin on 105.3 The Fan on Monday to address his time in Dallas before he went off to be the Texans' backup and actually got a big win down the stretch in relief of Brian Hoyer. "I heard about them. The whole coach comment, obviously that was directed at him, but in a joking manner. He kind of threw some shots at me, not only while I was there, but after I was gone. I didn't think it was appropriate at the time. I was out of there and they were still trying to win games. I just thought they were kind of uncalled for, personally. I know no one is going to stand up for me, so I have to kind of stand up for myself a little bit. I have no hard feelings toward him and definitely no one in that organization." Weeden also talked about his own regrets that his time in Dallas didn't work out being an Oklahoma native and growing up a Cowboys fan. "I wanted it to work out so bad. Growing up here in Oklahoma City, I always dreamed of playing football and having a star on my helmet. I think every little kid in this area did. I just wish we could've found a way to win at least two of those games I was starting. Things would've been completely different. I can't really say I have any regrets because I really didn't think I played all that bad, especially in the first two. ... The thing I guess I regret the most is just not finding a way to make one play to make a difference and give us a chance to win one or two of those games. I wanted to so badly for not only the organization but to keep things going for Tony, guys like Jason Witten and guys like that who have been doing it for a long time."